I’ve never taken myself as a huge Quantified Self practitioner – I might just not want to face how little I run, or how poor my eating habits can be – but I love keeping notes and records on some of my hobbies. I’ve been playing a game called Hearthstone lately – it’s an online card game based around managing your resources effectively creating a board of characters (called ‘minions’) and using these characters to defeat your opponent. Each month, a new league starts where you vie with other players for rank – rank 25 being the lowest rank, with 1 being the highest. People who surpass rank 1 get put into the Legend bracket, which is what I wanted to strive for – the Legend rank comprises approximately the top .3% of players in the game. After 104 games, I went from rank 5 to Legend (the difficulty ramps as you get lower in number), achieving my goal. How did I do it? By tracking and analyzing my match data, of course! I knew I was interested in getting some quantitative rigor into my play, so I set up a simple spreadsheet with some important variable I wanted to track such as whether I played first, if I won, what my opponent was playing, and some descriptive notes for more detail. After establishing a baseline of 30-40 games, I started to look at the data to go beyond the gut feelings I went off of for certain matchups – and found some interesting observations. With a few clicks in Tableau, I was able to see that my win rate varied drastically by what my opponent was playing and whether I played first or second. I saw that in some of my matches, playing first I won 80% of games, whereas playing second I won 40%. This let me look a bit deeper at the strategy for each match – what was so significant about playing first? Eventually, these insights helped me improve my bad matchups and stay even keel with my good ones. Decided what my message should be. 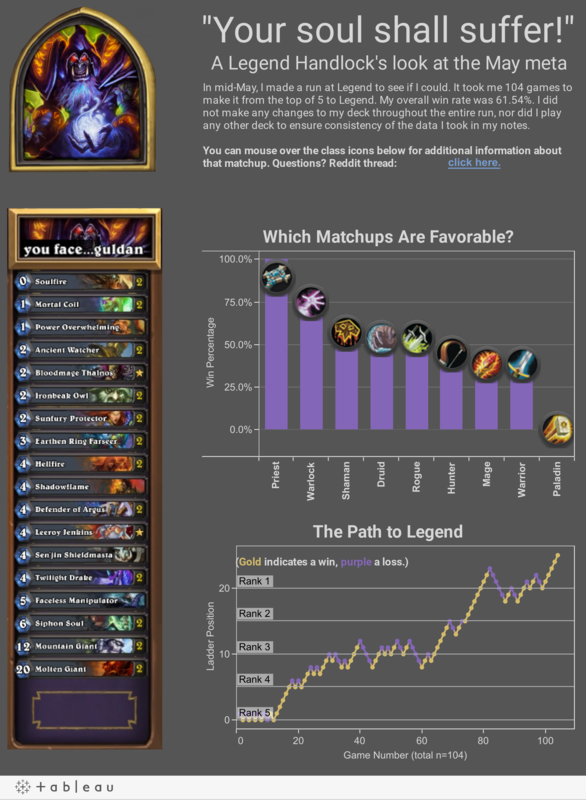 I decided to develop a persuasive dashboard, rather than an exploratory one, to show other people what I thought were the best matchups, and what were the worst with the deck I played. Developed a rough outline with pen and paper of what the viz might look like. While the initial outline changed in almost every detail to the final version of my viz, developing the outline was important for me to limit my thinking and focus on my specific message instead of going too broad. Got constructive feedback on the analysis and the layout. I ended up refining a lot of my first draft based off feedback from friends with skills in both of these areas. To get this, I circulated drafts of my work on Tableau Public to a small email list of friends I trusted. I’m pretty happy how everything turned out, and ended up getting a lot of positive comments from the Hearthstone community when I shared it with them. While this might not be the usual way of addressing Quantified Self, it addresses a common theme – that data is everywhere, and we can use it to understand the world better, and help others understand why we think the way we do.